My name is Capt. Bara’u Mohammed, an indigene of Kaduna State from Zaria Local Government Area. I was born on May 5, 1972. I was admitted into the aviation industry in 1990 to study Avionics (Aircraft Maintenance Engineering). I graduated in 1992. I got admission again in 1998 to study Standard Pilot (SP-22). 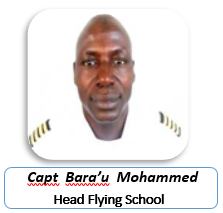 I graduated in 2004 with Commercial Pilot, Instrument and Multi-Engine rating. In 2005, the College sent me to Phoenix East Aviation, Daytona, Florida, USA for my Flight Instructor’s Rating (cfi, cfii, MEI), which I completed in 2006. I hold an Airline Transport Pilot Licence (ATPL) Course m 2010 from American Flyers, Florida, USA. To maintain the high standard of our graduating students. To provide aviation industry with highly trained pilots, dispatchers and cabin crew personnel, in order to maintain safe air transportation.